Today I would like to share this great article on herd dynamics and how important the herd is to the mental, emotional and physical development of horses. In nature, horses live in bands and the bonds formed within this extended family are bonds for life. Horses need this social interaction as much as they need air and food, and isolation is a major contributor to stress, illness, stereotypical behaviors and poor attitude. However, turnout as a lone horse denies a horse important herd dynamics and the lessons that can be taught by socializing with other horses. 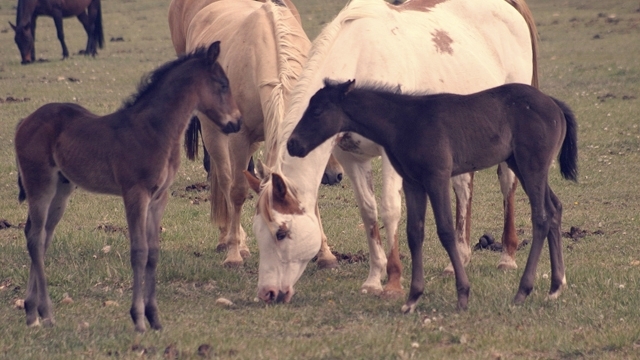 Although this may not always be possible or ideal with older, experienced and highly valued show stock, allowing a future performance horse to be raised in a herd structure proves beneficial to his development as a herd-savvy horse for the lessons and experiences that the herd can impart for all future encounters in and out of the pasture. The lack of the herd experience creates not only the problems caused by stall-bound horses not allowed to ‘be horses’—cribbing, weaving, insecurity and overaggressiveness—but it also creates performance horses who can’t perform.